"I've long regarded Core Set Sealed as my best and favorite format. Nowhere else are the fundamental skills of Magic so important. Nowhere else will a good understanding of the game be so consistently rewarded. There's simply no substitute for discipline in deck construction and wisdom in gameplay in Core Set Sealed." Now, I won't pretend to consider myself as good as Mr. Duke, but I will agree with his sentiments. Generally speaking, if you build solid decks and make good plays, you'll be able to do well in Core Set Sealed. You don't get rewarded for pulling off gimmicky decks, nor is there any incentive to do so in the first place. You could try Chromanticore.dek or Battle of Wits.deck in Core Set Sealed, but you'd be taking a foolish gamble just trying to look "cute". The power level of cards in a core set aren't on the same level as they would be in an expert level expansion. For example, you have Wingsteed Rider and Nessian Asp in Theros, where you can have Wind Drake and Sentinel Spider in core sets. They both have about the same stats and casting costs, but one group has much better abilities, while the other is just generic. That's not to say generic is bad, it's actually quite good! The games are less swingy, there are less blowouts so you're left with good honest Magic. Let's put it this way: I've lost many times to a Wingsteed Rider, but I don't think I've ever lost to Wind Drake. Normally, my Prerelease reports are less relevant than usual since the actual sealed format doesn't match the format you get at the Prerelease, but since we're all getting a free Prerelease, this type of report is more useful than it would be otherwise. I had a great time, I went on Saturday to avoid the 5+ hour event that is the midnight flight and to actually be well rested for when I go out and play. Even though winning isn't the #1 goal for this type of event, I still want to do well and give myself the best chance at doing so. Going to the midnight flight is fun, but it's less fun when you're trying to stay up at 3 a.m. while analyzing a difficult board state. I got to the store and they told me I could pick any color but black so I picked red. I wasn't surprised that black was already taken, it's the best promo and people like to win, so it's going to be taken first. My thinking was as long as I didn't have to play blue or green I'd be happy. After a while I was given my box, told we had 30 minutes to make our decks and we were off to the races. Let's crack some packs! The first M15 pack I opened was Ajani Steadfast and foil Perilous Vault. !!!! I was pretty excited at that point because even if I bombed out I had at least made back my money and then some, so I was in a pretty good mood from the start. I sorted everything by color and a few things stood out to me at the beginning: 1 - White was strong. Triplicate Spirits, Ajani Steadfast, and Avacyn, Guardian Angel are pretty strong pulls to play white. 2 - Blue was weak. Blue had the least amount of cards and the least amount of creatures as well. If I was playing blue, it would only be a splash. 3 - I opened a red paragon. I consider the paragon cycle to be pretty important in Sealed/Draft, and was happy to get one in my chosen color. 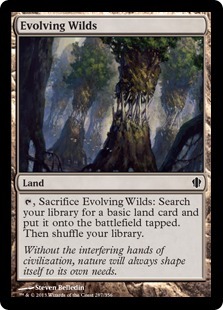 4 - Evolving Wilds. This lets me splash a card with relative ease. Once I ruled out the colors I'm not playing, I should see if there are any high impact spells that I can splash. My first round was against a 5 color brew that couldn't beat/tried to race me instead of killing Ajani. He was only in it for a few turns since I was stuck on mana, but once I drew my 5th and 6th lands he couldn't keep up with all the life I was gaining. Round 2 was against a GW player who was actually playing the white prerelease promo, but I didn't know that and assumed he was on green. Game 1 he was color screwed and an early Ajani managed to take it for me after a 20 minute game. He put enough pressure on me early on that I couldn't just win, I had to plus and minus my Ajani several times depending on the board state, but eventually some Triplicate Spirits took it for me. Game 2 I mulled down to 4 and kept 2 land, 2 6 drops on the draw expecting the game to be over relatively quickly. Oddly enough variance happened and my opponent flooded out early on and I managed to draw enough lands to make the game a competitive one and start racing him. I got him down to under 5 life with 2 minutes to go in the round (trying to win on a mull to 4 takes a long time!) and he used a Solemn Offering on his own Spirit Bonds to gain 4 and give him another turn, so I attack again and he's down to 1 draw step with me at under 5 life as well. Resolute Archangel. He goes on to win the game since I couldn't kill the Archangel and I drew a bunch of lands after he got back to 20, so we ended the match in a draw. Round 3 was against a very aggressive RW deck that had me barely win both games after my opponent chose to ignore Ajani and try to race the lifelink ability. Admittedly, he wasn't really interested in playing anymore, so he clearly wasn't playing optimally each turn. Round 4 found me facing a GW player who resoundedly beat me in game 1 with double Triplicate Spirits into Sanctified Charge for 18 damage in the air. At this point I found myself considering going into either RW or RG for Siege Dragon, but after reading that the Pyroclasm effect doesn't hit fliers, I just prayed that he didn't draw well in games 2 and 3. I believe that he stumbled on mana in game 2, I'm not really sure, all I remember is that I won that one pretty easily so it was onto game 3 with him on the play. We both had pretty decent draws, but mine had fliers while his didn't and I was able to get in a lot of free damage via Razorfoot Griffin and Triplicate Spirits while holding off his ground forces and ended up winning the match because of it. I do recognize that I got extremely lucky to win the one, as I dodged both Triplicate Spirits and the Hornet Queen he had while managing to beat a Hornet Nest. When I looked over the set, I thought that the format would revolve around the paragons and the ability to go wide or over people in combat. This because the average toughness of commons/uncommons is 2-3, while the power is at 2 for most 1-5 drops, so you're going to see a lot of creatures bouncing off of each other, but realistically, you're going to get into board stalls frequently. Not to mention that convoke is the mechanic of the set, and each color has at least 1-2 cards with convoke, so you're expected to go wide at some point to be able to cast these convoke spells on the cheap. Cards like Raise the Alarm help that theme of having a bunch of small creatures to help convoke the more powerful spells. But the issue with this is that to go wide, you have to have smaller creatures as a tradeoff, so if you're not able to push damage through, then you're just sitting there doing nothing. This is where the paragons come in. The +1/+1 breaks combat right open and now your 2/2s and 2/3s no longer trade/bounce off your opponent, they actually deal damage and force double blocks to happen. I didn't see a lot of paragons in action, so I can't tell you from experience that I'm correct, but I can tell you that evasion matters. I won a lot of my games just by attacking with 2/1s, 1/1s, and 2/2s in the air because my opponent couldn't block them. Not to mention that the opponent can't really punish you on the crackback because their creatures are underpowered, making attacking in the air and initiating the race a much more profitable transaction. What do you guys think? Am I right about what I've thought about M15, or did you experience something different? As always, if you have any comments, questions, or concerns, please leave them in the comments section below. Next week I'll be saying farewell to Theros Block and talk about M15 Draft. As I looked at your pool, I had a hard time saying no to Black, but you might be right. I know at my Pre Release, I didn't really have much support from my Rares, so I ended up building a B/R destroy everything and win with Witches' Familiars and Thundering Giants. I think with your pool I either build a B/W or R/W, but R/G could be correct too. My inclination is that you are a better sealed deck player than I am so you would know! I took the Black seeded pack and the promo was really good. I really am, like many, tired of the seeded packs. Luckily I got to play a "traditional" sealed the next week, playing R/B again but this time splashing G for Apex Predator. I went 3-1 in each tournament. Thanks for your report! It will be interesting to see how this format develops. The problem with black is that it won't ever win you the game by itself. All it really has is a few removal spells and an Accursed Spirit. I'd play at most 7 of my black cards and have to play 15/16 cards of another color. At that point your black is a splash, and none of my colors are so strong that they can win the game on their own. Double Flesh to Dust is hard to pass up at first glance, but once you look into the color, you'll realize why it can't be played. I like them, but they have to be balanced and similar to each other in power level. In M15 and JOU, there was clearly a promo that was the best, so basically you fought to get the best one, or you got whatever else was left. From a play perspective, having to play against the same promo every match is annoying/frustrating (especially since I think everyone will go black on MTGO) so that takes some fun out of it. If they can't balance the rares to make them all equally attractive, then they should just go back to 6x boosters. But personally, I'd be fine seeing them do away with the seeded packs. All that removal though! I think black looks soooooooo good at the surface but when you break it down it's not as great as it could be.